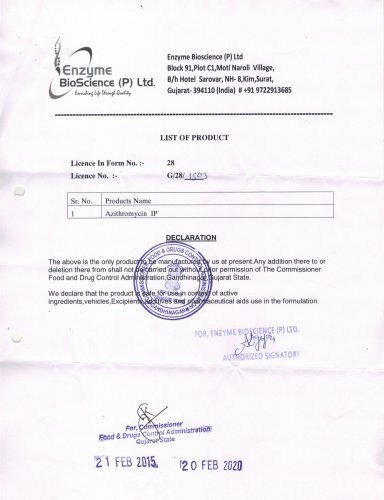 Established in the year 2013 at Surat (Gujarat, India), we "Enzyme Bioscience Private Limited" are engaged in manufacturing and exporting a comprehensive range of Pharmaceutical Enzymes, Industrial Enzymes, Maltodextrin Powder, Meat Tenderizer Powder, etc. These products are known in market for their higher enzyme activity, stability, less enzyme dosage, easier processing and higher yield. We have an infrastructure equipped with all the advanced facilities that enable us to offer a high quality range of products in the market. Our R&D unit is always engaged in conducting research activities that help us in improving our methods of production and the quality of range of enzymes offered by us. With the undying efforts of our R&D unit, we have also been able to introduce new products in our range. 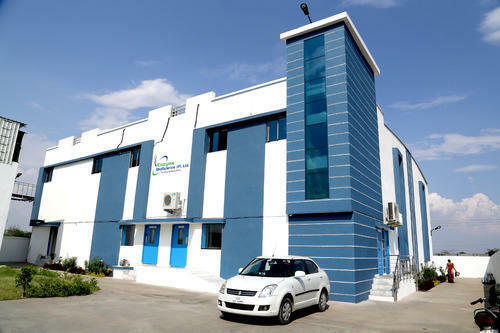 We also have a capacious warehouse, which helps in the systematic storage of the stock. The entire stock is properly labelled and stored in the warehouse as per their specific categories. Besides, our team of experts understands the client's requirements and makes sure to offer the products accordingly. This helps us in attaining maximum level of client satisfaction. 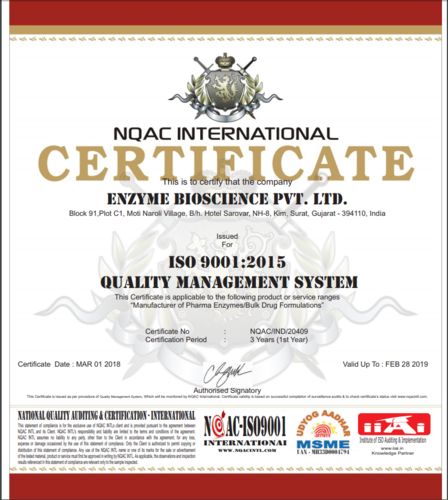 Our quality controllers check enzymes on certain well-defined standard parameters, so that our customers get a range of defect-free products from our end. Moreover, we have been widely admired for making prompt delivery of the ordered products at the client's end. 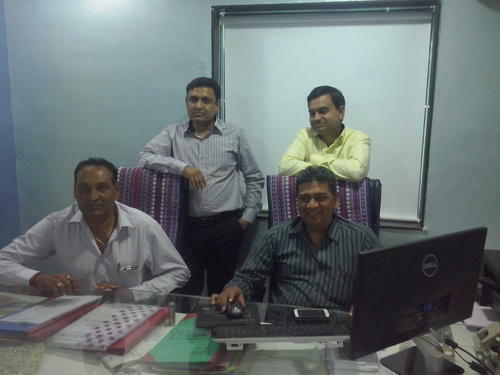 "Mr. Alpesh Gajera" is considered as the strongest pillar of our organization. Owing to his firm commitment and inspiring attitude, the people associated with our organization are motivated to achieve excellence in all the business tasks performed by them. 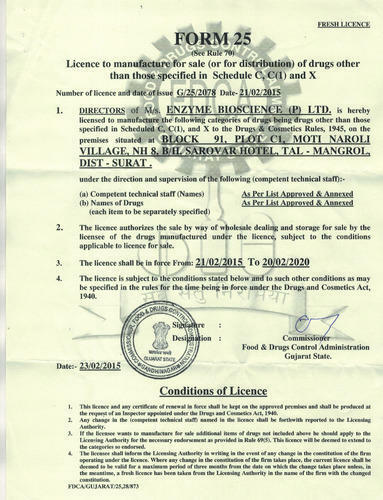 Product licensed by Food Drug Control under Administration, Gujarat State. We owe the credit of our success to our hard working and dedicated employees. The team directs all its efforts towards the achievement of a number of organizational goals and objectives. The team is hired on the basis of skills and experience possessed by each individual. For the purpose of better management, the teams are sorted into several groups. The units work in a synchronized manner, for improving the standard of quality and the production capacity. 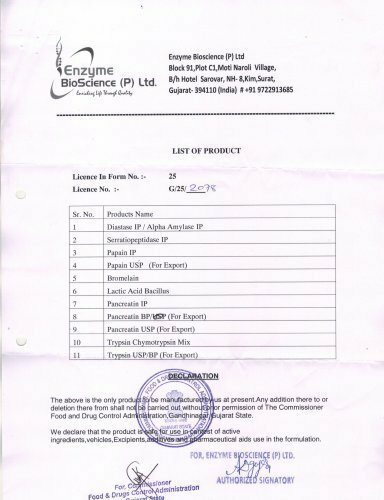 Products licensed by Food Drug Control under Administration, Gujarat State. FDCA (Food & Drug Control Administration) Licence to manufacturing pharma enzymes formulations. Our infrastructure which is spread over a wide area of land, is carefully divided into several units. Manufacturing, warehousing, packaging, in-house quality testing and sales & marketing units are essential units of our infrastructure. 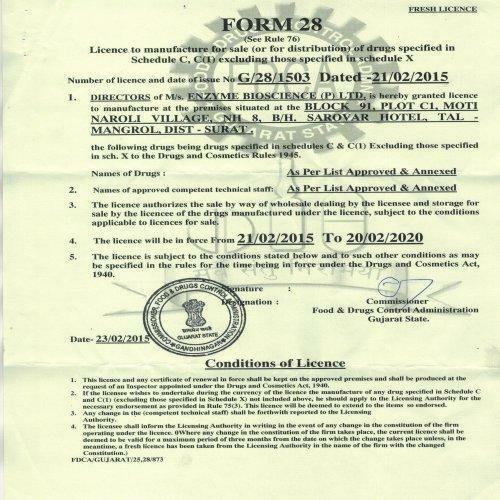 We are licensed by Food Drug Control under Administration, Gujarat State. Being one of the finest manufacturers of this commendable range, we direct all our efforts towards providing the finest quality products. Thus, we manufacture this range using the finest ingredients that are available, in a precise composition, while maintaining a precise pH level. Owing to this, the effectiveness it provides is highly commendable. Post production, the range is sent for a number of quality checks for maintaining the desired quality standards. Along with this, we offer mutually beneficial business terms to the customers and ensure timely delivery of the products.